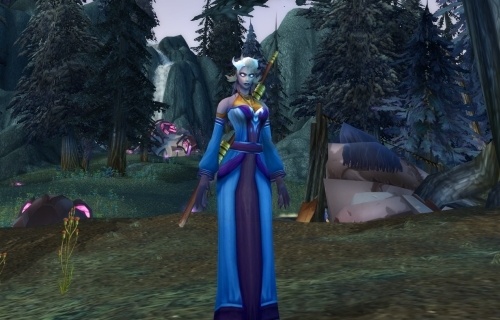 Enter Eruditia, the Draenei Mage. Stepping out of my crashed escape pod, I am immediately stuck by the beauty of my surroundings. Looking around the misty forest I have found myself in, I find myself looking at the most beautiful starting area I have ever seen. The landscape has a slightly mystical feel to it, possibly because of the blue-green hues that subtly coat the landscape. Everything about Azuremyst Isle, with its rugged waterfalls and enchanted moths, not to mention the soul-stirring background music, all evokes a forgotten wonderland. Well, forgotten that is until the Draenei pilot pressed the wrong button! The smoking pink-crystal wreckage of our vessel stains the surrounding area, creating an exciting contrast to the sleepy woodland. It’s then that I notice a wounded colleague beside me and my adventure begins. However, to be fair the Draenei are not too bad in this regard. Once the perfunctory maiming and killing of local fauna is out of the way, a defined story comes together as I help my fellow survivors of the crash. My objectives are pretty simple: first help any injured crew-members I can find, and secondly to reverse the damage that the radiation from our ship has done to the environment of Azuremyst Isle. This second mission actually proves to lessen my cynicism and soon I am capturing some mutated monstrosities for study. Imagine my delight when it turns out that these abominations can be cured of their mutation and turn back into cute little bunnies! Maybe the Draenei aren’t so bad after all? 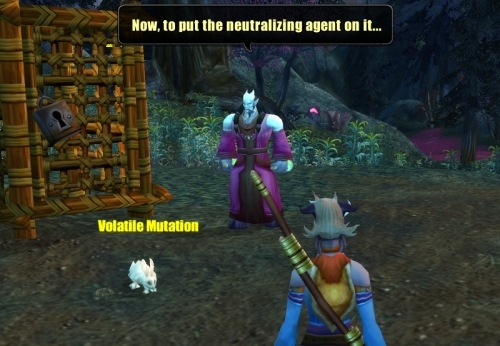 The volatile mutant was actually Mr Snuffles! Moving on, the plot thickens as I try to help an attractive Draenei technician at the crash-site repair her communications device and send out an SOS. This has me wandering all around the crash-site, recovering items and also curing some other beasties who’s biology has been messed around with by our mad-space technology. I am starting to wonder who invented all this wildlife-corrupting technology in the first place, but I try to ignore this worrying detail. The quests had a very nice organic explorer feeling to them, similar to the Night Elf area. 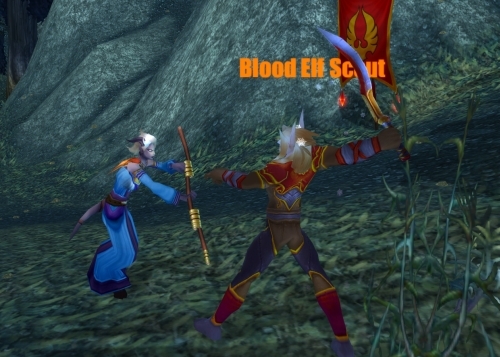 Then things got really interesting when my efforts were hampered by the appearance of a familiar enemy… Blood Elves. At first I am bewildered as to what Blood Elves would be doing so far away from home, but then it all becomes clear. 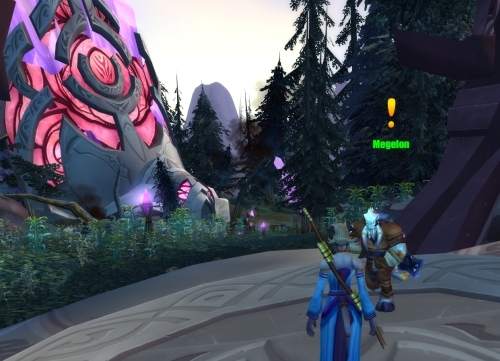 The Draenei fled Outland in the Exodar under attack from the forces of Kael’thas. These Blood Elves I now face have been sent by good ol’ KT to finish the job. Resetting my mind back into where the plot was in the early Burning Crusade era, I am pleased to be involved in the larger storyline so quickly. After all, the events unfolding here at these low levels will go on to expand into some seriously large plot points that affect the whole of Azeroth and Outland. I'm not sure which makes less sense here: Holographic technology or Draenei knee-socks? So, having done my work at the crash-site, I moved on to the next questing area: Azure Watch. This makeshift camp proved to be a great quest hub that kept me busy for many hours with some fantastic quests. Before I get onto the good, let me touch on the bad. 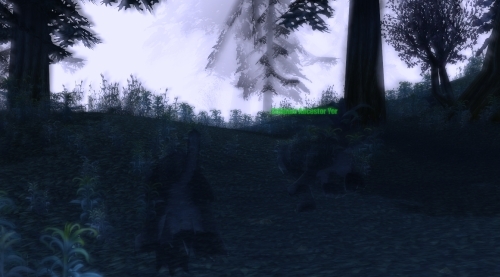 One quest that I refused to do was for a hunter who wanted me to kill off the Stags which wandered the nearby forest. Ah, the old kill-defenseless-animals questlines return! Seriously, I’m surprised DEHTA hasn’t nuked every Alliance starting zone from orbit by now. The stags were beautiful, majestic creatures and I found myself completely unable to harm them. So instead I spent quite some time using my emotes to insult the callous quest-giver in Eruditia’s best faux-Russian (and I must say Russian is a most satisfying accent to insult people in!). I was very pleased to meet one of the Broken. I have a real soft spot for these suffering heroes and wish I could play as one! However the other quests at Azure Watch were a lot of good fun. One long quest chain involved me helping an injured Night Elf we discovered and then making contact with a nearby Alliance campsite. It seems these Alliance ships had been marooned here by Goblins and we become makeshift allies to deal with our respective problems. This is a very nice touch, as the key moments when the Draenei become involved with the Alliance are enacted by the player. This was brilliant stuff that presumably laid the foundations for the narrative Death Knight starting zone in Wrath. 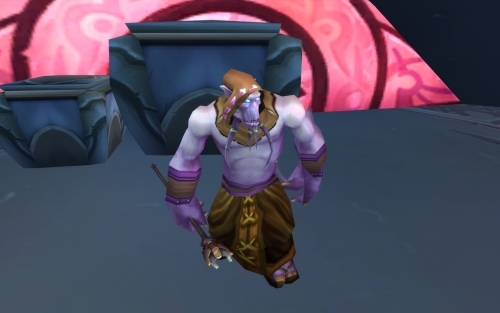 It’s also worth noting that before the Alliance would help us, my first step was to prove to them that the Draenei were nothing like their evil cousins the Eredar. Lots of bonus points for going into detailed lore background there! Hey Allies! Wanna be... allies? 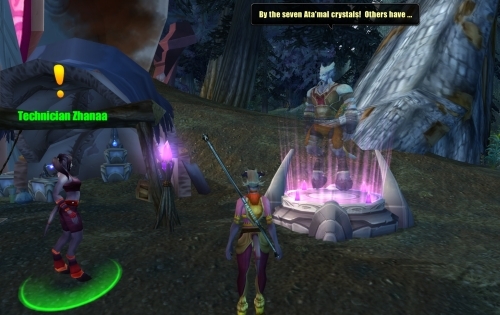 However the Alliance questline paled in comparison to the next one I discovered, which involved helping the Draenei make contact with the Furbolg tribes native to Azuremyst. This involved me finding magical means to understand their language, which led me on a fantastic quest all over the island. I hunted down mystical totems of the Furbolg Shamans, each of which put me in communion with the ancestral spirits the Furbolg worshipped and magically transformed me into a variety of cool creatures. This involved some awesome and extremely pretty phasing technology, allowing me to travel the island as a spirit-panther. Not only was this extremely cool, but the Shaman in me rejoiced at this extremely fun questline. Helping the Furbolg evolved into a diverse and thrilling quest-chain, the end of which I won’t spoil for you, but it’s a good story! Enter the trippy Spirit World, you won't be disappointed! By the time I completed the Furbolg quest-chain I was well into level 10 and had completed my sight-seeing goals. However there was still much more to be done, and I hadn’t even ventured onto the neighbouring Bloodmyst Isle that I could so tantalising see across the water. I logged off feeling contented, but eager to see more! Final Thoughts: I have to admit it, I like the Draenei a lot more now! This is hands-down the best starting area I have ever played, with the possible exception of the Death Knight starting area which came much later. The zone has it all, beautiful evocative atmosphere, fun engaging questlines that link directly into the larger plot of the game, and it firmly puts you in the driving seat as the hero of your people and saviour of anthropomorphic peoples everywhere! I still think the Draenei are stuck-up holier-than-thou types, but I’ve also seen a heroic noble side to them that I kind of love. Plus who can resist the comedy Russian vibe? I will definitely be logging on Eruditia again to finish exploring this magical lost world! I completely agree with you once again! I too feel the Draenei end up being a little one-dimensional, too pure, too noble for believability in my eyes…but their starting zone is very, very well done. It quickly established a LOT of core lore, and it does do a really good job of explaining just HOW noble and pure they are, since they make friends with everyone (except blood elves, but that’s understandable.) I quite enjoyed their interaction with the various Alliance races, and how the other races clearly don’t know what to make of these new blue-skinned aliens. Agreed, I love the Draenai. I just wish they were available Horde side and not on Alliance. I’d gladly trade them the Blood Elves. Yes, I know. Borkened lore. But yeah. The quest where you get to be a spirit panther is one of my favourites. I hope they introduce more cool quests in lower level zones in Cataclysm. Great post. 🙂 My first main was a draenei shaman, and even though I still think the draenei backstory is pretty weird (and understand the rage of WoW purists) that starting area was so magical to me. The furlbog quest really blew my mind. Bloodmyst definitely has some memorable quests too! I will admit here that in leveling in the Draenei starting zone I’ve come to hate this race less… of course… I still hate them and will kill them on site… but at least I won’t gloat over killing them… well… much. I too think out of all the existing starting zones they, by far, have the most engaging. No other race, Horde side included, relies on such rich storytelling in the beginning areas. So, I have a question for you. After playing the races thus far what do you think of their racials? I can tell you after playing a Draenai for a day I began to understand how non-healers could magically gain health right before my eyes in a bg. Good question! To be honest the racials haven’t come up much so far, other than the Gift of the Naaru, which is truly fantastic. That +1% hit aura the Draenei have is very nice as well, but not really a factor for me at low levels obviously. The Night Elf ones were ok. Shadowmeld I thought was a bit meh. I really liked Wisp form though, the couple of times I died I was back to my body in no time. Plus it was a nice touch in terms of background. The Human ones I didn’t even notice at all. Most of their stuff is very passive, other than their free escape button, which didn’t really come up in my experience, as the poor kobolds I was killing didn’t even know how to defend themselves, let alone cast CC! So in short… Gift of the Naaru ftw! My favourite racial ever remains Will of the Forsaken though. Orc Blood Fury is nice too, even if it does just get macroed into everything. Usually I’d rather play Horde – although lately I switched my main to Alliance to join my co-workers’ guild. Of the Alliance races, I do like the Draenei the best. And I love the shaman questline and the beautiful starting area. I have now rolled a Draenei paladin to serve as my bank alt and I go there and work on the low level quests when I just need to be somewhere serene. Oh, Gift of the Naaru, how you spoil us for playing all other races! Seriously, is that not the best racial ever? And I’m completely with you on the beauty of the starting area, but Exodar… what a train wreck (erm, I mean spaceship wreck?). Agreed, Azuremyst is a pretty fun starter zone. However, after leveling 1-12 more times than I can count, that initial grind feels unbearably boring no matter which starter zone I’m in. Azuremyst was incredibly enjoyable on my first trip through, though.